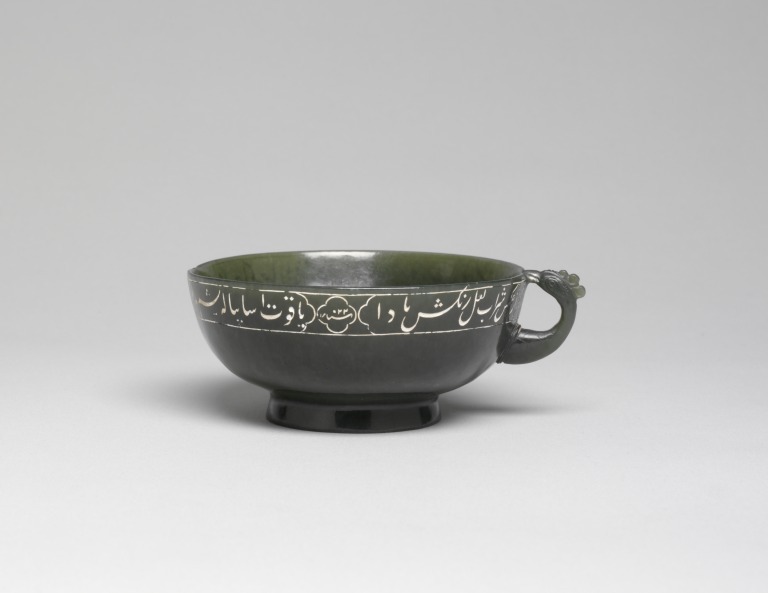 This wine cup of dark green nephrite jade was owned by the Mughal emperor Jahangir (r.1605-1627), whose name is included in the Persian verses incised in nasta'liq script round the rim and filled at a later date with white composition. The verses may be translated "Through the World-Conquering Shah, the world found order/ Our time became filled with light by the radiance of his justice/From the reflection of his spinel-coloured wine may/The jade cup be for ever like a ruby". The verses are interrupted by two quatrefoils containing the date according to the Muslim era (1022) and the emperor's regnal year (8) which together show that the cup was inscribed between 21 February and 6 August 1613. The quatrain includes a verse known to have been written by Sa'ida-ye Gilani, the head of the royal goldsmiths' department during the reign of Jahangir, who was also a master calligrapher who specialised in inscribing jade and precious stones. The writing on the cup also compares closely with that on a spinel known to have been calligraphed by Sa'ida, thus making it almost certain that he was the maker of the cup, as demonstrated by A.S. Melikian-Chirvani in "Sa'ida-ye Gilani and the Iranian Style Jades of Hindustan", Bulletin of the Asia Institute, New Series/Volume 13, 1999, , pp. 83-140. The cup was part of the collection of the Royal Asiatic Society deposited in the India Museum and transferred to the South Kensington Museum in 1879, before being given to the V&A in 1924. Shallow cup of dark green nephrite jade, with one handle in the shape of a cockerel's head and neck. Persian verses and the date incised on the rim, filled at a later date with white composition. The Persian quatrain is interrupted by two quatrefoils containing the regnal year (sana 8) and the Muslim era year (sana 1022), which gives a date corresponding to 21 February - 6 August 1613 when the court resided at Agra. The cup was made for the Mughal emperor Jahangir. After coming to the UK, it was bequeathed by N. B. Edmonstone to the Royal Asiatic Society and was with that part of the Society's collection transferred 'temporarily' to the India Museum in London in 1869. The museum of the Royal Asiatic Society had been maintained from the founding of the Society in 1823 to 1869 when it moved to smaller premises (see Kathy Lazenbatt, "The Early History and Collections of the RAS" in Royal Asiatic Society, Newsletter, Spring 2008, pp. 7-9). The Indian Museum's collections in turn were dispersed in 1879, and the cup came with other material to the South Kensington Museum. At that time, it was presumed that all the objects from the Royal Asiatic Society had been given to the Indian Museum. In 1923, however, their status as loans to the Indian Museum was recognised and all the items were reviewed, with most being given by the RAS to what was now the Victoria and Albert Museum. The wine cup of Jahangir was purchased, for £100 (see RP1924/2593, Minute from CSC [Caspar Stanley Clarke] dated 27.V.'24). 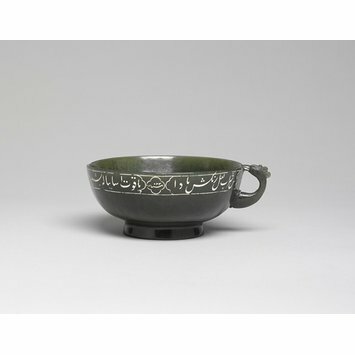 Wine cup of Jahangir, nephrite jade, Mughal, dated 1022 AH/1613-14. A.S. Melikian-Chirvani, "Sa'ida-ye Gilani and the Iranian Style Jades of Hindustan", Bulletin of the Asia Institute, New Series/Volume 13, 1999, , pp. 83-140. Guy, J., and Swallow, D., (eds). ‘Arts of India: 1550-1900’. London : Victoria and Albert Museum, 1990. ISBN 1851770224.p83, no.59. Rogers, Emma: Arts of Asia, vol. 45, no. 5, September - October 2015, "The Parasol Foundation Trust Programme: digitising and cataloguing the V&A's South Asian collection. ", p. 110,pl. 34. Robert Skelton, in The Indian Heritage. Court Life and Arts under Mughal Rule, V&A, 1982, cat. 351, p.117, ISBN 0906969263.